My baby boy loves bath and shower time, and I love the fantastic range of bath products we use to keep him fresh and clean. I found the Ecostore collection in Babies’R’Us on one of my ‘got to get ready before this baby arrives any day now!’ shopping sprees. The New Zealand company uses plant and mineral based ingredients from natural or renewable resources whenever possible, and you won’t find any nasty chemicals. Baby shampoo: We only use this occasionally while Aidan is so young but this sweet shampoo leaves his fine hair soft and shiny. I love the blend of lavender and geranium oils. Baby body wash: The gentle cleansing body wash is made with plant-based ingredients that match the oils and amino acids found naturally in your baby’s skin. We have been using this instead of soap. Baby Sleepytime bath: A few drops of these calming essential oils can be added to your baby’s bath to soothe and relax them before bedtime. Baby nappy balm: The plant-based balm is rich in antioxidants, non-greasy and non-staining. 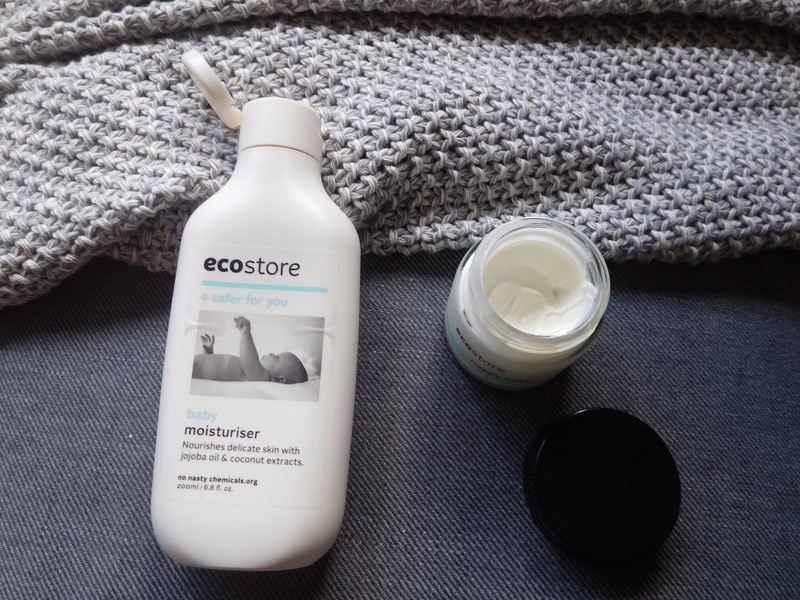 Ecostore say it’s great if your baby has sensitive skin, nappy rash or cradle cap. Baby moisturiser: Our favourite product is the moisturiser which contains “nourishing cocoa and shea nut butters in an olive, jojoba and coconut oil base to gently nourish and protect your baby’s delicate skin”. It’s great to massage into your baby’s skin after bath time and has been fantastic for keeping our boy’s skin soft and healthy.